After emigrating in 1958 to New York, Kuwayama abandoned the traditional form of Japanese painting he had studied at the Tokyo National University and opted to experiment in Color Field painting. After his first solo show at the Green Gallery, he chose to obscure the artist’s hand in painting, something that was anathema to the aesthetic he had pursued in Japan. Using spray paint, he removed any vestige of his manual authorship of his new works. He enlarged his repertoire first by integrating vertical aluminum strips to provide divisions in his paintings and then by incorporating metallic pigments and translucent layers of paint to make the appearance of surfaces transform as the viewer’s position changes. Kuwayama’s works were frequently created as a series of objects where positioning of each element could be varied, thus producing a number of potential series in a gallery installation. 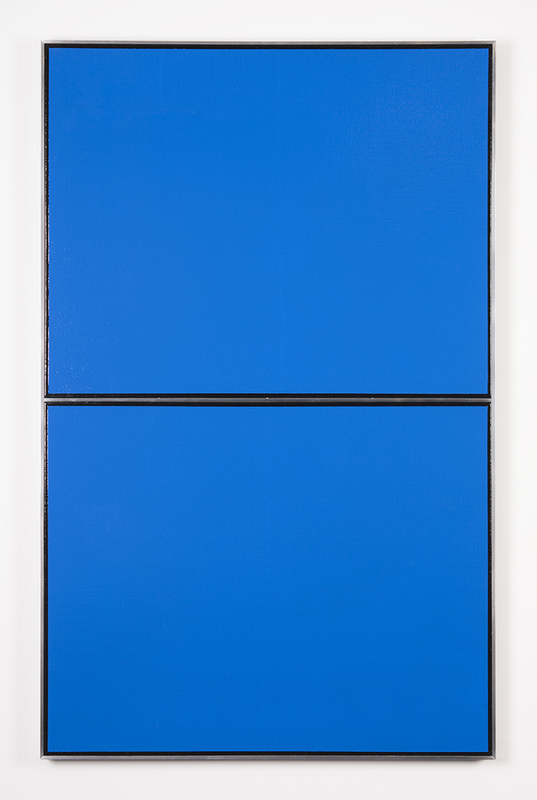 Untitled (Blue) TK4139-1/4’65 (1965), is an example of this approach. The title is an accession number of sorts, coded with Kuwayama’s initials and the date as well as the variation number. Kuwayama won a National Endowment for the Arts grant (1969) and an Adolph and Esther Gottlieb Foundation grant (1986). He lives and works in New York.